After some deliberation, I contacted the ebay seller about this moldy CNNP brick which was advertised as being dry "Lucifuge" stored. To my happy surprise, he promptly shipped me another replacement. His reassuring words exactly "Hi, Friend, So sorry. May be stored close to the ground. The ground is so wet. Don't worry. I will resend. Before sending, I will carefully check." And carefully check he did as the second brick showed absolutely no signs of mold. I'm assuming he sniffed up the replacement brick as the original wrapping was unmolested. Actually it doesn't take a hound dog and I personally needed only one continuous whiff between the two bricks to differentiate that moldy shicang "wet storage" smell. You can imagine inside a storage warehouse crammed full of massive amounts of tea- not everything gets evenly rotated. So even in the same lot of tea from the same vendor we have this kind of disparity. The original brick with shipping cost me ~$48 which is too steep for what it is. But I am inadvertently the lucky recipient of a storage learning kit. Probably this nothing special brick was no more than a yuan when it was newborn. At $24 each, it's a palatable price for drinkable albeit mindless undemanding sheng and I will be comparing it against that famous White Whale in a week or so. When I brewed these two examples side by side, I surprise myself by enjoying the furry version more. The "wet stored" version conjures up a more dynamic taste compared(!) to the drier brick. But as the brews progress- the two more or less become more similar. But drinking the teas cooled amplifies the storage taste- I cannot stomach the furry brick once cold. Drinking teas cold is also how I gauge quality in shu- a good shu you can drink cold as the heat can mask the storage flavors. A shu that you thought was not so bad can be gross at room temperature. 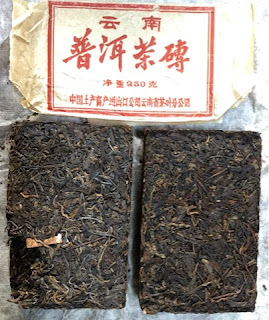 In the search for last of the cheap aged sheng, I probably am scraping bottom in 2014. I have mixed feelings about drinking (originally) cheap bricks like this one - I would not stoop to buying a newborn CNNP brick now. But the spectre of a continually shrinking pool of aged tea combined with ever inflating prices makes me grasp at these last chances. I've been buying at today's fool's prices because even in a few years from now I would have been a fool not to. 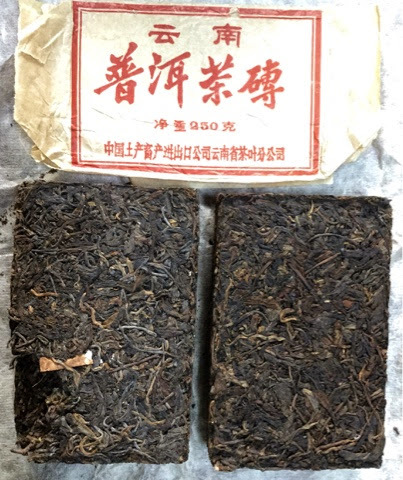 We're lucky that most Chinese puerh investors appear not to have much interest in this moldy tea. That shicang smell and flavor- it really can be instinctively off-putting at first- your brain can send all sorts of pre-wired warning signals not to drink it. It took well over a year before I went over the hump. It's more likely that there will be increasing market demand for such traditionally stored tea and not less. Whether it's worth investing $300+ on a better aged cake instead of a $50 brick, I've sent away for more samples to investigate. I'm working through aged samples tea friends have sent me, and I'm leaning towards having a representative range from low to high. I'm not obsessed with having only top end cakes because for me I mostly want daily enjoyment of easy sheng I can drink. Knowing what you want even for the present is really a big step alone.